Codependency is based on a lie. Its symptoms develop to cope with the deep, but false and painful belief – that “I’m not worthy of love and respect.” In the chart to the left, core symptoms of codependency are in red, but nearly all the symptoms revolve around shame – the shame that accompanies rejection. This entire system operates beneath our awareness, and until we know it and feel it, we’re caught in its grip. 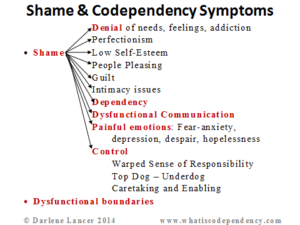 The symptoms of codependency are either caused by shame or are or are defenses to feeling shame, as explained in Conquering Shame and Codependency. Most codependents grow up feeling ashamed of their real feelings, wants, and/or needs. As adults they deny, devalue, and/or don’t express them to avoid their shame. Some people can’t identify them at all, and willingly put those of others first. This leads to anxiety, depression, obsessions and addictive behavior. Later, they feel anger and resentment or hurt and uncared about. Especially during courtship, they accommodate and please in order to be loved by someone to avoid a breakup. Once married, there’s often disappointment when the relationship feels unequal. Shame is a feeling that leads to self-destructive thoughts and negative self-evaluations, which produces low self-esteem. Self-esteem isn’t so much a feeling, but how we think about ourselves. When we have toxic shame and make a mistake, whether real or imagined, our feelings of guilt are exaggerated and irrational. If we don’t believe we’re worthy of love, we must control what we show to others. We don’t communicate what we feel, or express our needs and wants. Instead, we have hidden expectations, and manipulate, hint, or become passive-aggressive. We hide who we are. Authenticity is compromised, and communication becomes dysfunctional. When we can’t be real, intimacy suffers. Initially, there may be wonderful romance, but eventually couples’ behavior becomes ritualized; sharing and closeness that first brought them together happens less infrequently, because they conceal anything that might upset the status quo for fear of feeling rejected or judged. Still, “shame anxiety” – the fear of being judged or rejected – haunts codependents. To cope and to get what they need and want, they attempt to manipulate and control others. This becomes a necessity when we’re dependent on someone loving us or just staying with us in order to feel okay about ourselves or just to feel safe. Being alone for some people triggers feelings of shame, fear, and loneliness, while others manage fine on their own, yet are very reactive or lose themselves in relationships. This is their dependency. Their mood and happiness depend on someone else’s, and their self-esteem depends on acceptance by other people. They then have to manage others people’s feelings and behavior. People-pleasing and giving are ways to do that, as are creating drama, threats, and demands. If our well-being and self-esteem depend on another person, it makes sense to think a lot about his or her motives, intentions, feelings, and behavior in order to feel secure. This accounts for codependents’ focus on and obsession about loved ones. Caretaking others is another form of control. If someone is dependent on me and needs me, then s/he won’t reject or leave me. Also, if I’m the one giving and helping someone else, then I don’t have to be vulnerable. My partner can be the vulnerable, “Underdog,” while I can feel strong as “Top dog” and Underdog’s protector, helper, or confidant. Such an imbalanced relationship breeds anger and resentment by both partners. Many codependents are perfectionists. In their mind, they must be perfect, because the alternative is that they will “look bad” in some way or feel like a failure. Mistakes or flaws create great discomfort due to shame arising within. They may feel anxious, angry or driven to fix something, when really they’re attempting to fix their own inner, unconscious, sense of inadequacy. They live with the “tyranny of the should’s” fed by shame anxiety and perfectionism. Making mistakes, being human, feeling ordinary, are not acceptable; these are experienced as shame. Learning new behavior, such as learning to be assertive, go a long way to raise self-esteem and build autonomy (rather than dependency). These steps can empower you and give you a greater sense of control and happiness in your life. (See my books and webinars on building self-esteem and learning to be assertive.) Changing lifelong habits isn’t easy or quick. It requires real courage and the support of a therapist or experienced sponsor in a 12-Step group to do the recommended work in the Twelve Steps. However, for enduring recovery, we must truly undo the lie that envelops us. Confronting and healing the core issue of shame are required for lasting change and to prevent relapse into unhealthy relationships. Start by working the steps in Conquering Shame and Codependency. Ideally, begin therapy with a trained, licensed psychotherapist.